It is a fabulous resource for people who have a number of food allergies or sensitivities, and I am just about working my way through all the recipes. Here is a scrummy-yummy pudding that is free of dairy, gluten, yeast, corn, sugar, soy, nightshades and orange. It is aptly named Incredibly Easy Pie! All you do is blend all the ingredients together and bake in a moderate oven for 1/2 – 3/4 hour or until it is set. It is suggested that this pudding be served with stewed fruit, and also that you can slice apples and place them on the bottom of the pie dish with a sprinkle of cinnamon before pouring over the mixture. We did the sliced apple suggestion and it was sweet and light and delicious! And they are right – it WOULD be great served with stewed fruit, but sadly I didn’t have any and couldn’t wait to make any so there is no more pie now. Nothing left to take a photo of either. I ate the rest for breakfast this morning – and I reckon you could make it with soaked oats instead of coconut – which would essentially be THIS wonderful recipe that we have enjoyed several times in the last two weeks. Another delicious recipe I found was for salmon. I can’t believe how easy and delicious it was. I am a little afraid of fish to tell you the truth. I have never had much success in cooking fish at home – it is always over done or under done and now my kids won’t eat it at all. What a shame because from now on ALL fish is going to be cooked like THIS!!!! 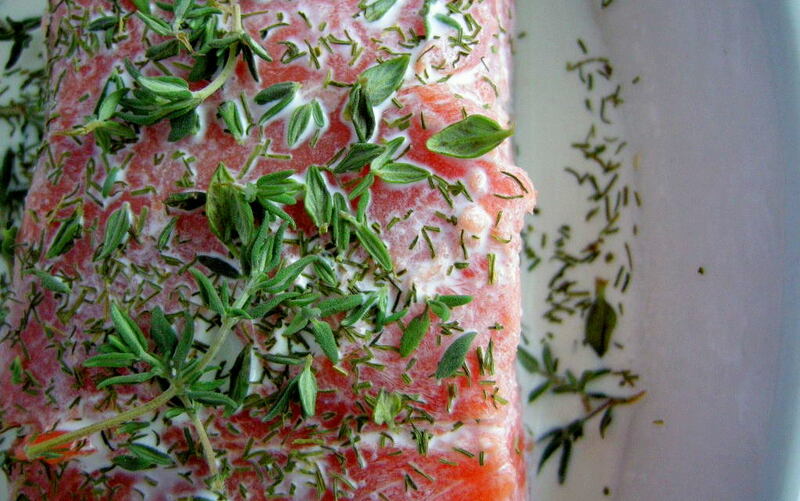 The recipe is Salmon Baked in Cream and Herbs. Of course I didn’t use cream, but instead I used coconut cream. Ooh my, I made it two days ago and am still thinking of how delicious it was. This recipe is from the Nourished Kitchen and I thoroughly recommend having a good look at it!